The teaching staff of the department has been actively involved in the publication of students' papers and abstracts dopovidyey in various economic journals and regularly attracts them to participate in conferences, both in Ukraine and abroad. Проблеми і перспективи створення ефективного фінансового механізму / Матеріали студентської наукової конференції (Дніпропетровськ, 25-26 квітня 2013 року). – Дніпропетровськ: ДВНЗ «НГУ», 2013. – с. 109. 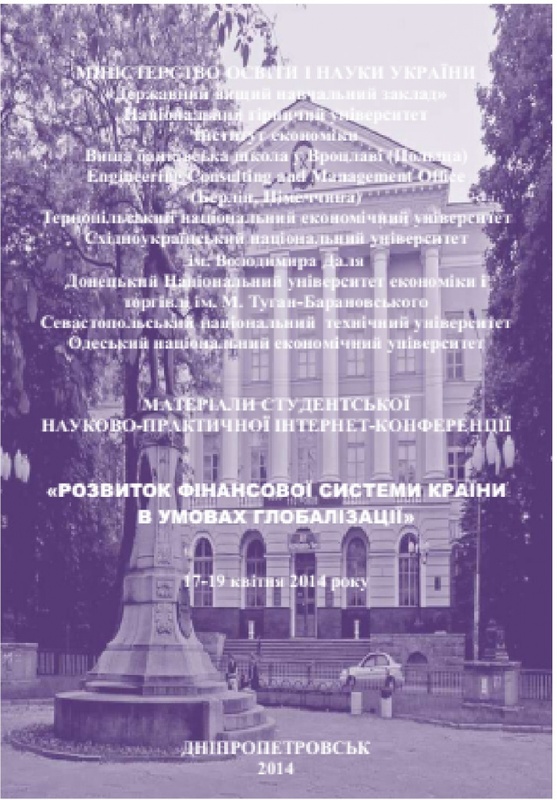 The article presents abstracts of the International scientific -practical conference "Problems and prospects of innovative development of economy of Ukraine." The problems associated with the development of economic theory and economic practice , economic problems of innovative development bank and commercial complex enterprises, environmental and economic problems of the environment, problems and prospects of a well-functioning financial mechanism of innovation development of Ukraine on improving accounting and auditing problems of innovation management , theoretical modeling of practical problems in the management of innovation development of economy , the development of business education as a factor in the development of innovative regional economy. The results of research on contemporary issues of globalization and integration processes participation of Ukrainian and Polish companies address environmental and socio- economic issues related to the integration processes , increased competition and the intensification of production.